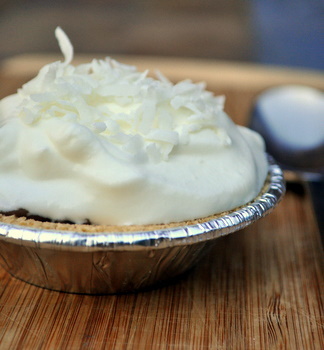 Coconut cream pie is always a favorite of mine, mostly because I am a big fan of coconut, but also because I like the additional texture that coconut adds to a cream pie. I’ve had some coconut cream pies that are too dense, too thick. I like mine to be lighter, with a creamy mouthfeel. Sometimes, this means that the pie filling is a little less stable than other pie fillings. Fortunately, it is easy to solve this problem by packaging the pies in individual pie shells, letting the creamy coconut filling be scooped up by the spoonful and not sliced into. These are individual chocolate coconut cream pies and the filling is a chocolate-infused variation on my usual coconut cream pie. I simply added some chopped bittersweet chocolate to the pie filling and whisked it in well. It adds some richness, as well as a good chocolate flavor. I noted in my recipe that you should use finely chopped sweetened coconut in this recipe. I achieved this texture by pulsing shredded coconut in the food processor several times. The finely chopped coconut suits the chocolate pudding a little bit more, and doesn’t stand out against the dark backdrop (so each bite looks more appetizing). Unsweetened coconut would also work well, but since the chocolate used is quite dark, there isn’t much need to worry about the filling being too sweet. For an extra burst of chocolate, as well as to keep the graham cracker crusts from getting soggy, I brushed them with melted chocolate before filling them. I also gave in and used store bought miniature graham cracker crusts for these. You can make them yourself easily. Just mix up a batch of graham cracker crust crumbs and divide it into a muffin pan. Press the crumbs up the sides and firmly into the base, then bake at 350F for about 15 minutes, until browned. Let them cool before using. Still, since the filling for these individual pies can be whipped up on the stovetop, I’d take the shortcut and buy the little crusts if they stock them at your local grocer. Brush individual graham cracker crusts with melted chocolate, using about 1.5-oz. Place in the refrigerator to set up. In a large bowl, whisk together flour, sugar and salt. Whisk in eggs, half & half and coconut milk until very smooth. Strain mixture into a medium saucepan. Pour into chocolate-lined pie shells and refrigerate until chilled – about 3 hours, or overnight. Top with sweetened whipped cream to serve. 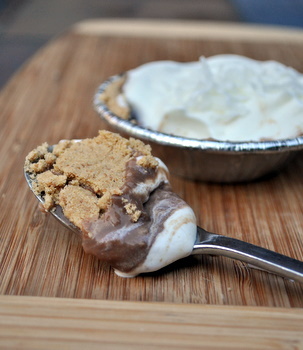 Note: Different individual graham cracker pie shells can be different sizes, and homemade ones can be a bit small. If you have extra pie filling after you have filled your shells, simply pour it into some ramekins, top with whipped cream and serve as a pudding! 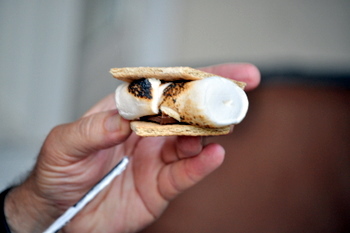 Owwwwww I’m def gonna make this one, I love yer blog! How perfect. That crust looks soooo good. Perfect complement to the coconut. eh… Yum!!! Love making little mini pies. So much easier/better for eating. this looks perfect! i love coconut and chocolate! and individual no-bake desserts are so great since i cook for one. Lining the crusts with chocolate to keep them crisp is a great idea. I’ll definitely have to try these out soon. Perfect for a party. Hmmmmm, coconut and chocolate. That looks so great.